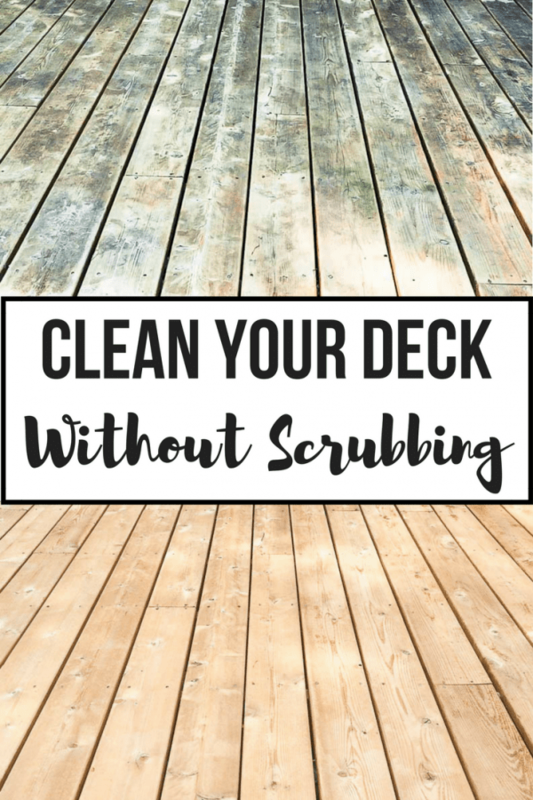 This deck cleaner and brightener works like magic, making wood look new again! I’ll show you how to get your deck ready for new stain without back-breaking scrubbing or sanding. 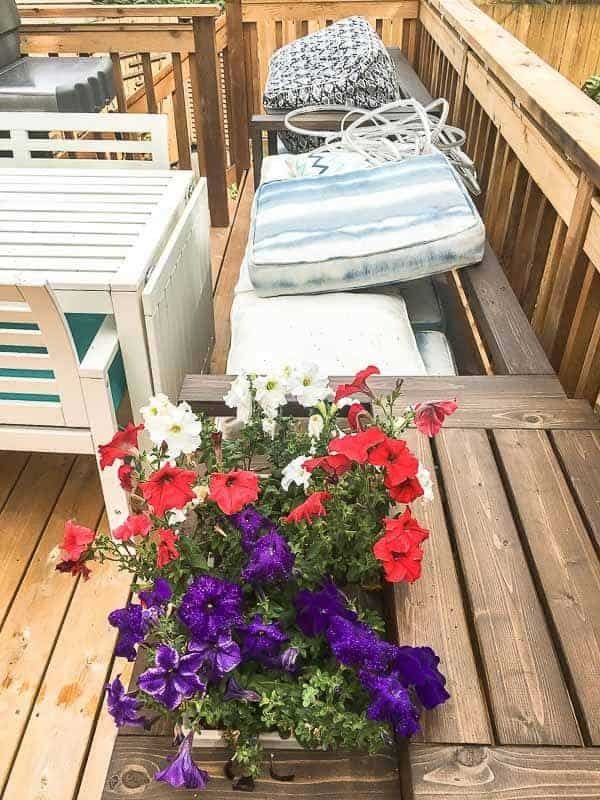 I’ve been putting off the task of re-staining our deck all summer long. Last time, it took FOREVER! But I learned from my mistakes, and this time I’m armed with the right deck cleaner and supplies for the job. Now the wood looks like it just came from the mill (seriously!) and is ready for a new coat of deck stain. Gross! Mildew built up under the furniture, and sections of stain had worn away in high traffic areas. This was beyond what a quick cleaning could handle. I needed to strip off the old stain and start fresh. My video below gives you a quick overview of the process, and the amazing transformation. For more details, keep reading! This is mine. It works great, and you can usually find it on Amazon for less than $75! 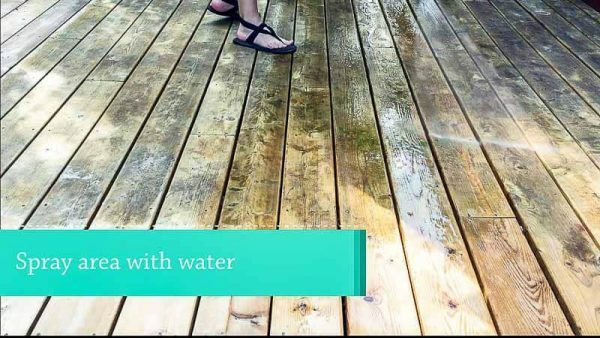 Before you start spraying water everywhere, you might want to tackle a few deck repairs first. Popped nails and uneven boards will make it hard to stain the surface properly. 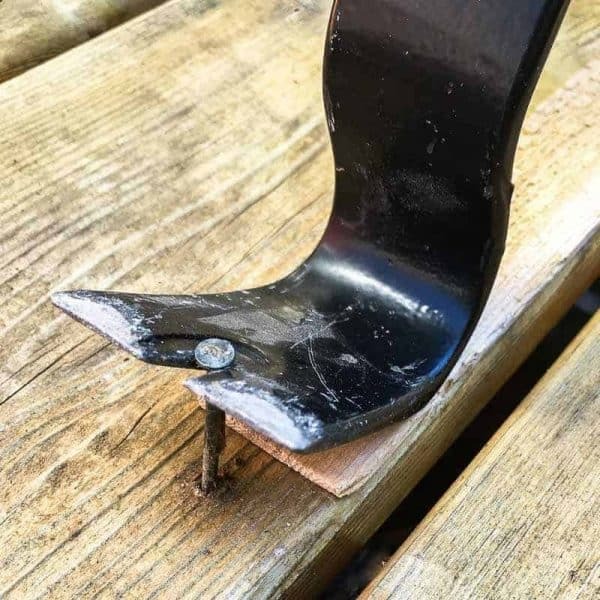 Check out my post on three easy deck repairs any homeowner can do, then get them done! It’s a huge chore to move all the furniture off the deck, so I like to work in large sections instead. I pushed everything to one side and the empty side was swept clean. I also removed the outdoor rope lights I installed a few months ago from the underside of the deck railing. Don your chemical-resistant gloves, and pour Restore-a-Deck cleaner into a gallon of water in a garden chemical sprayer as directed. Close it up, give it a good shake, then let the crystals dissolve for a few minutes. 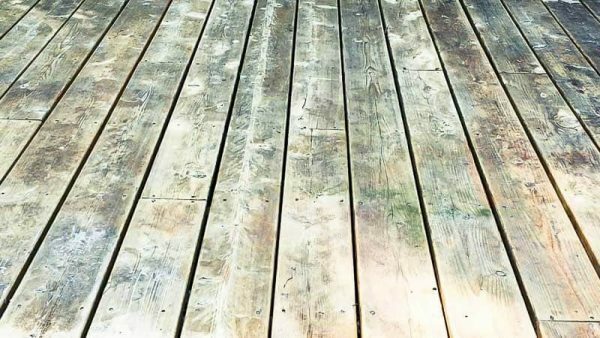 Give the deck wood a quick rinsing with the wide angle spray of the power washer. 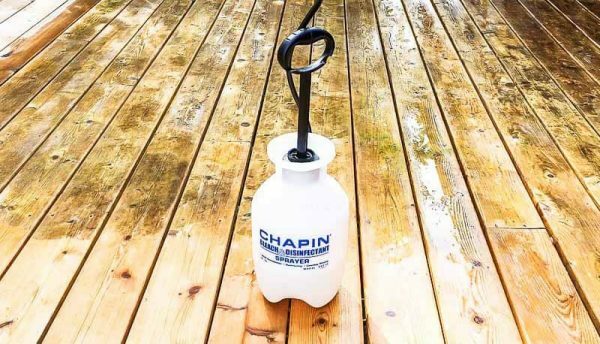 Apply the deck cleaner to an 8 foot square section of wet wood using the wand of the garden sprayer. Take your time and make sure the entire area is saturated. The wood should become darker after a few seconds. Add additional cleaner to any spots that haven’t turned color after a minute or so. Let it soak in for 15-20 minutes. 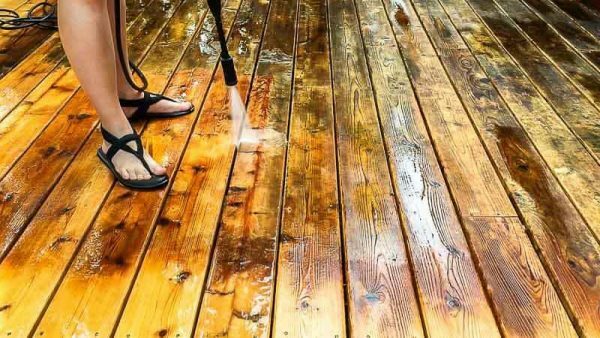 Don’t let the deck cleaner dry out completely on the surface of the wood. Set the nozzle of your power washer to about 50% power. 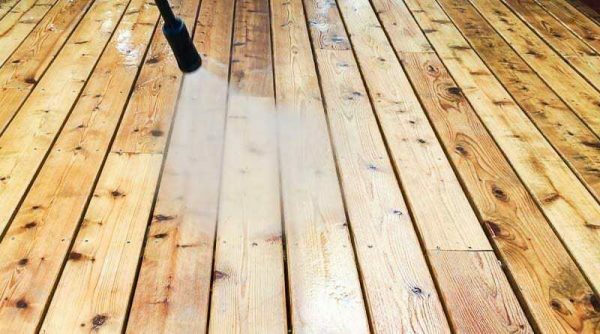 It should be strong enough to clean the grime off the surface of the wood easily without gouging it or damaging the fibers. 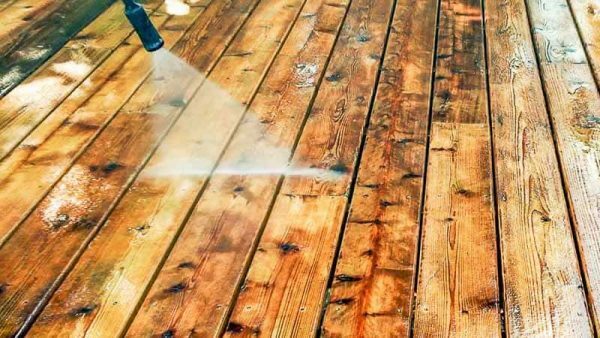 Slowly power wash the entire area you sprayed with the deck cleaner. Use long strokes to avoid creating fan patterns in the wood. This part is really satisfying! 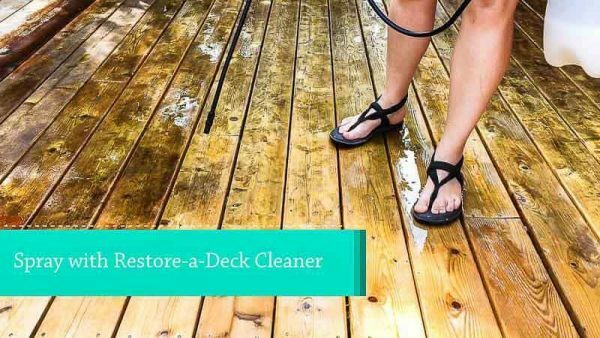 This deck cleaner removes a layer of damaged wood fibers as well as dirt and mildew. 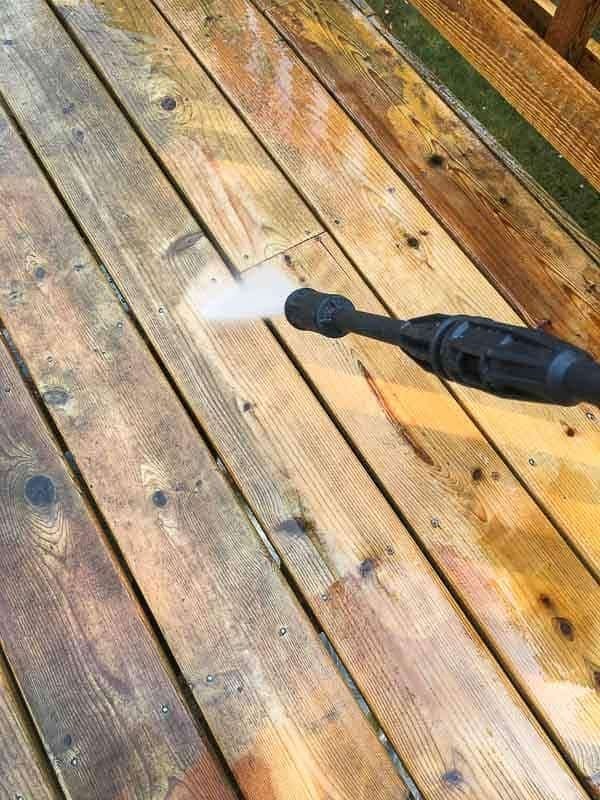 Use the widest fan setting on the power washer to push all the gunk off the side of the deck. You don’t want it to dry on the surface and ruin all your hard work! You’ll notice that the wood is mottled and dark in some spots. The pH of the wood has been changed, and needs to be restored to normal levels. This is where the brightener comes in! In a second garden chemical sprayer, add brightener to the water as directed. Give it a shake and let it dissolve. Then, spray the same area with the brightener. Within seconds, the wood will start to lighten and look like new! Hit any dark spots that remain with more brightener. Keep in mind that natural wood color varies, and you might have a darker board mixed in that won’t get as light as the others. 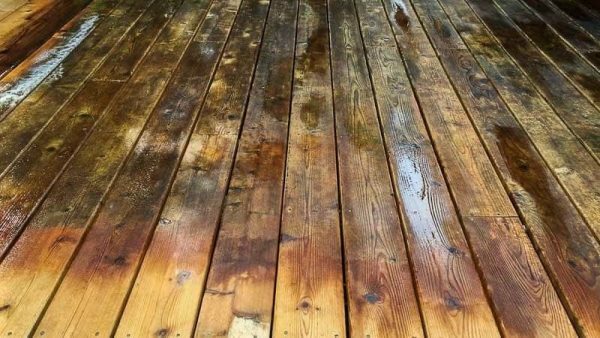 Leave the brightener on the wood for 10-15 minutes, then rinse off with the widest setting on the power washer until it no longer suds up. 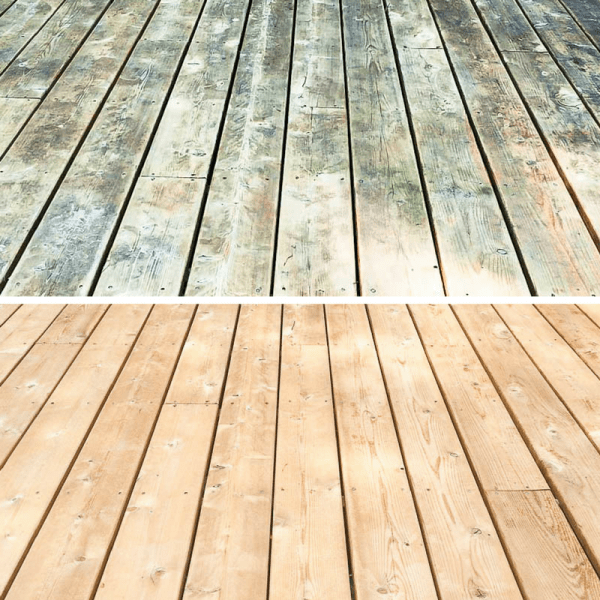 Allow your deck to dry for at least two days before staining the wood. If it rains during that time, restart the clock! You have a few weeks before the effects of the brightener start to wear off. This might seem like a ton of work, but I’d much rather do this than scrub! I managed to complete the entire surface of the deck in just a few hours, and most of that was waiting for the chemicals to do their thing. The stairs and spindles took another day. 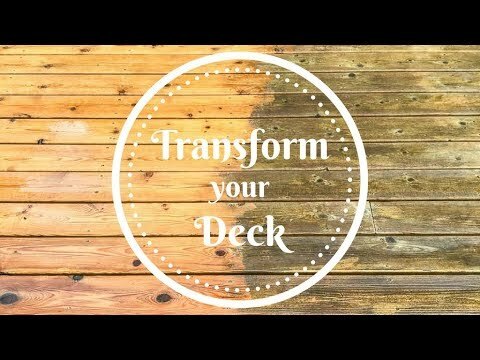 Want to see how the stained deck turned out? 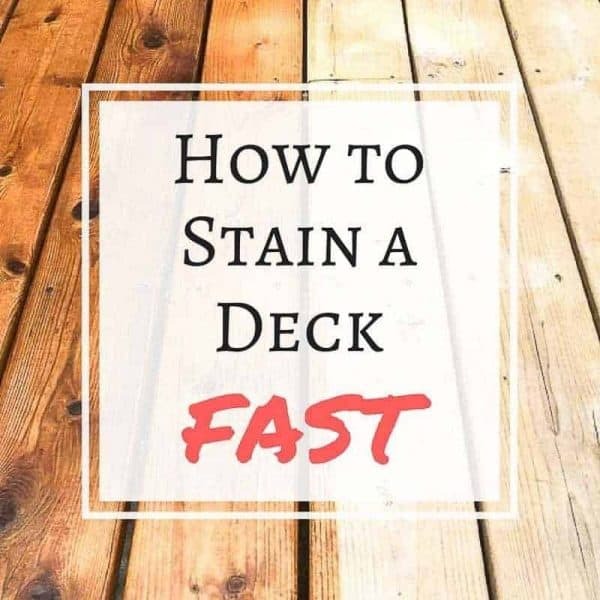 Check out my post on how to stain a deck FAST to see the final result! While you’re at it, why don’t you clean your siding too? 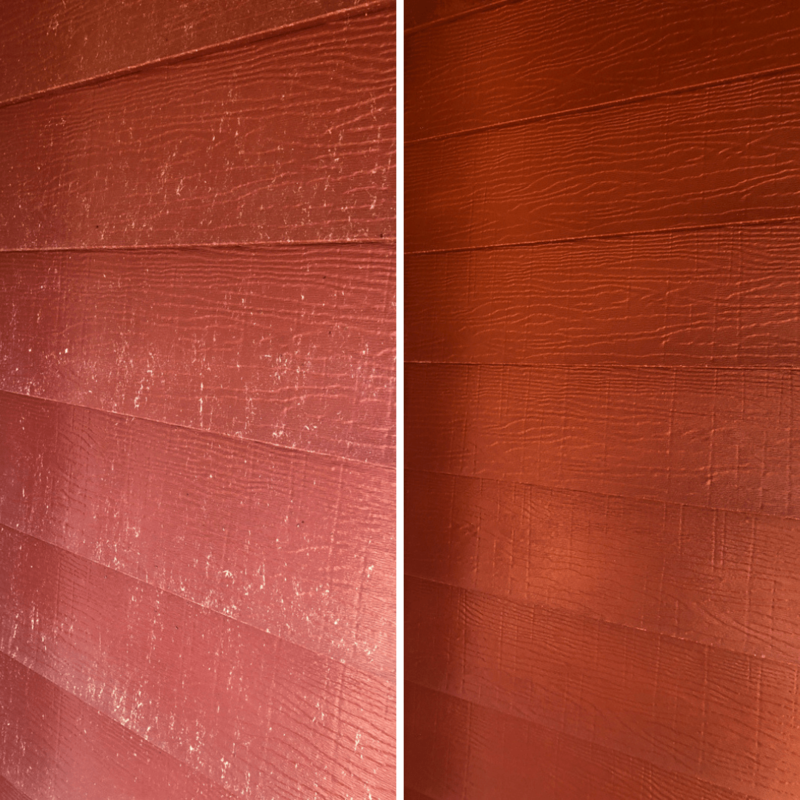 Check out my guide on how to clean aluminum siding, which also applies to vinyl siding! 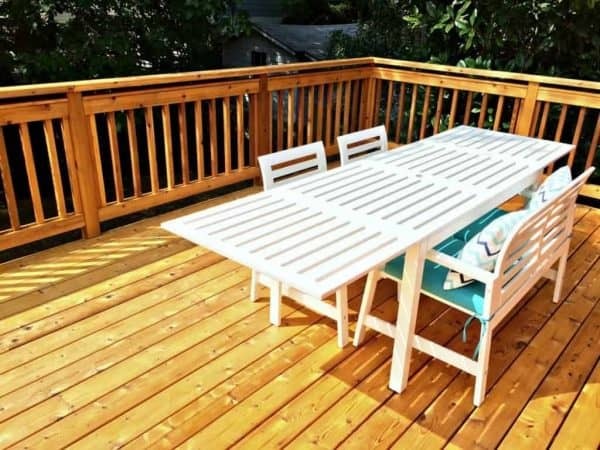 Need some new furniture for your freshly cleaned deck? 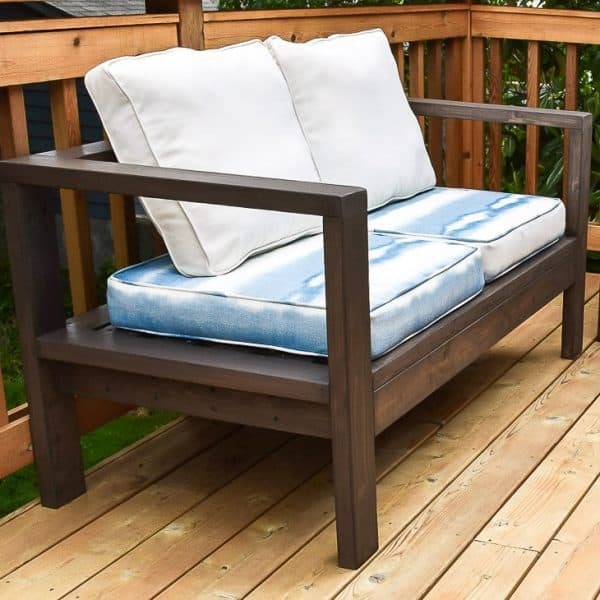 Check out the tutorials for my outdoor sofa and loveseat and end table with planter or ice bucket, and download the free woodworking plans today! That stuff is amazing! I am not a fan of weathered wood so that stuff would be a necessity if we had a natural deck. Really fencing or any kind of posts it would work great. 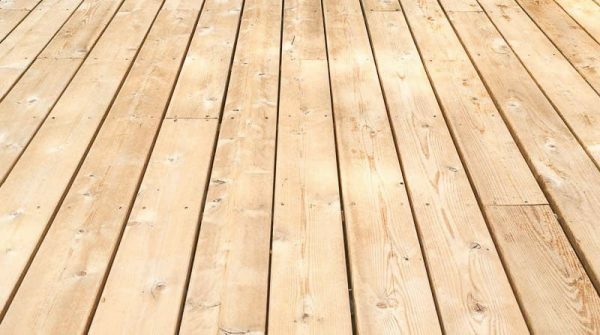 Love it, your deck looks brand new. I love how it looks after it’s clean! The wood is such a pretty color! I had forgotten what the original color was until I cleaned it! I decided to go with a stain that’s similar to the natural wood color so hopefully it stays that way for a while! Wow! I can’t believe the difference. 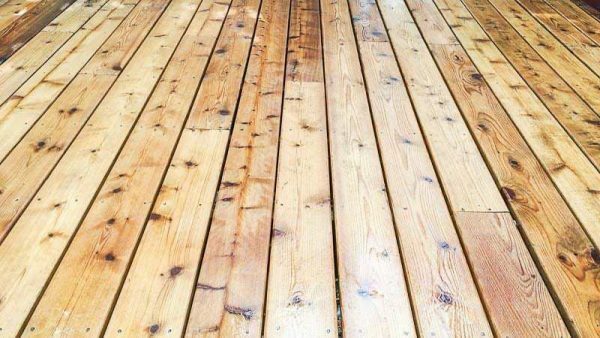 Your deck looks brand new. 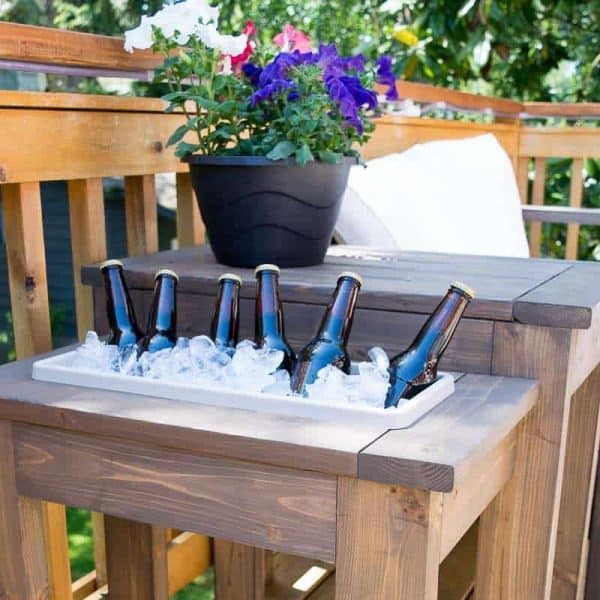 I have to give this a try for the cottage. This is awesome. Pinned! Thank you for sharing at the To Grandma’s House We Go DIY, Crafts, Recipes and More Wednesday LInk party! Hope to see you again next week.